First things first, if you are still having problems with my RSS feed in Google Reader, you need to subscribe to this feed url: http://feeds.feedburner.com/EverybodyLikesSandwiches instead of the one you are currently using. Why? No idea. Just go with it and everything will be better. And that’s the last word on that. Okie doke, now back to more important matters, like food! This week over at ReadyMade I take a stab at writing about my journey to love cucumbers. After my tzatziki post a few weeks ago apparently a few other people also have issues with The Cuke, so head on over and read all about it. Maybe you’ll relate or at least discover a new recipe to fuel your new found cucumber love. Also because I love food objects with eyeballs and mustaches, I had to illustrate that jaunty green fella above. Got buttermilk? Maybe you bought a carton to make some biscuits or pancakes but aren’t sure what to do with whatever is left? 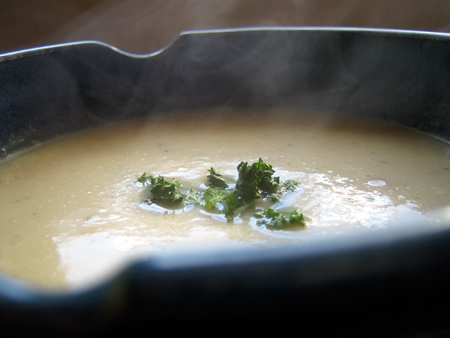 Get inspired over at Poppytalk where I give a wonderfully tangy recipe for cauliflower soup. Buttermilk in soup, it’s a good thing. I was so excited when I first realized I could use buttermilk in applications other than baking! Buttermilk french toast was my epiphany. That soups sounds wonderful. I already love you, cucumbers! Don’t cry! – got 1/2 litre of buttermilk I didn-t t feeling like drinking. hooray. all in all truly a success. That photograph is seriously gorgeous. I can practically feel the steam on my face. Happy weekend to you and The Cuke! That’s a very dapper looking Mr. Cucumber!! He looks British with his bowler hat whereas, Mr. Tomato reminds me of an Italian chef! LOL! I have refused to eat cucumbers or anything cucumber-related, but these blogs inspired me to go out and buy one and put it in a fantastic sandwich with hummus. Brave new world! I’m always at a loss for what to do that with that half container of buttermilk that is always leftover from some baking recipe or another (Irish Car Bomb Cupcakes, for example…) I’m off to check out your post! I love cucumbers, and I love the cucumber illustration accompanying this post! sarah, that french toast sounds amazing! eileen, glad to see a cuke lover speak out! la ninja, glad i could sort out your life this weekend for you! karen, this post is for you. i can see that, bijoux! brave new worlds, all around, christine! thanks joanne, i hope it helps expand your buttermilk horizons! I love the new website, it looks great! The heading is so cute and funny too. The cauliflower soup looks and sounds yummy! I love cauliflower, but it always needs a little help because it is, sadly, so bland. This soup sounds perfect. I admit, I became a real buttermilk fan when I realized how fluffy it made my homemade pancakes. congratulations on your own domain! i’ve been a follower for a while and your recipes and photographs definitely make me salivate!! Margot, the blandness of cauliflower shines here (does blandness shine? I think it can!). Yet another solution for that half a jug of buttermilk that always manages to go bad in my fridge! I know I could freeze it, but I’m always putting it off, thinking I’ll come up with some brilliant way to use it… and then I never do. Soup to the rescue! Lo, soup is always to the rescue!